Make today so awesome, yesterday gets jealous…. When I started this kind of “diary blog” I didn’t really expect that I would a) have so much I’d want to write about and b) have so little time to write. We packed up and left the UK, on the trip of a lifetime 19 months ago. It felt like an adventure, like we were intrepid explorers, like we were the bravest family out there. Even with Monty vomiting into Tesco carrier bags on the way to Heathrow, and Poppy begging us not to go through with it, I felt like Michael Palin, I felt free, I felt brave, I felt excited beyond belief and I felt pretty damn magnificent. “I’m going to write a blog about our new life” I announced at check in, whilst holding another bag for Monty and rubbing his tummy. Tim looked at me as if I had just announced I was having twins, Monty vomited again and Poppy rolled her eyes. We checked in our bags, and found the play area in terminal 3. This was my chance to start my “adventurers blog”. We hadn’t really packed up our lives and decided to travel the world with four backpacks and the kids (that would be awesome). We were off to Australia to “live“. Although this was a massive deal for us, and pretty gutsy in such a short space of time, we were by no means the first family to do this, nor will we be the last. I am now starting to realise that in order to “adventure“, annoying little things like work, school, grocery shopping, wiping bottoms, laundry and various other mundane things must get done first, which in turn, gets in the way of exciting and vibrant blog posts. Having said that, Monty is becoming a dab hand at wiping his own bottom, so that will soon be a job I don’t have on my daily list! 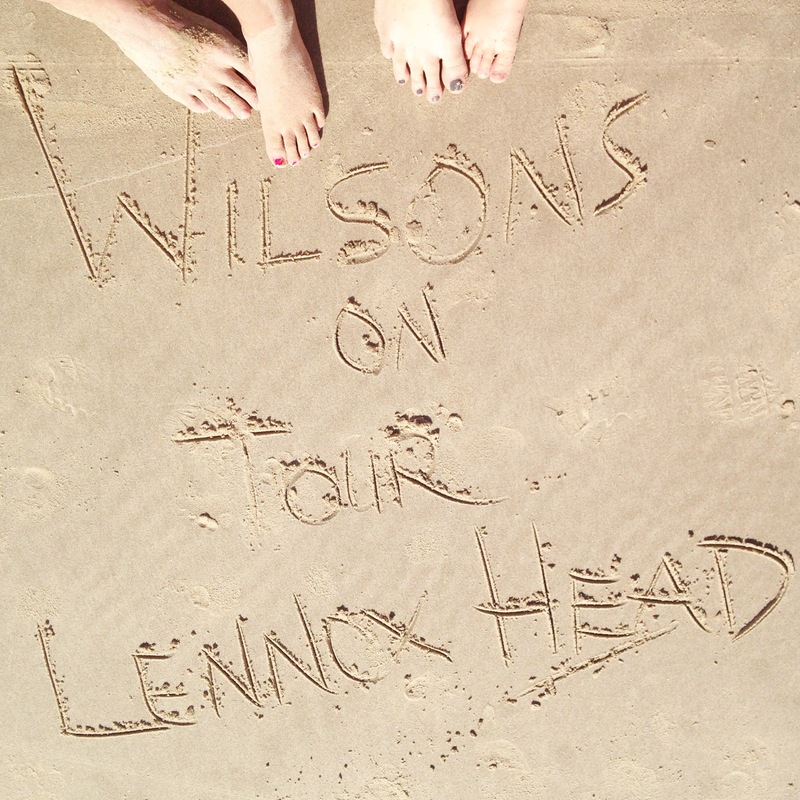 So, the wait is over and we are fresh back from our latest trip to Lennox Head and Byron Bay. I have written this over and over again, editing away, trying my hardest to take out the 37 “Awesome’s” and 12 “OMG’s”. New South Wales is just breathtaking. A few kilometres out of Sydney and everything comes alive with beauty. We decided to drive the 777 km instead of flying so we didn’t miss anything at all. The children were plugged into the DVD players, Paw Patrol was spinning madly, and we were cruising toward our first stop. We managed to nail 550km and we stopped overnight at The Bentleigh Inn in Coffs Harbour. The beautiful owners had stayed up late to let us in. We were hoping that we would be able to transfer the children from the car straight into bed, but no! They were full of beans, tearing open the complimentary cookies, laughing hysterically, and dropping crumbs in all the beds, whilst demanding we put cartoons on the TV. How no one had a smacked bottom I will never know. Motor Inns always fill me with dread. The anticipation of what the room and the neighbours will be like. I always imagine they will be like something out of an american horror film, where someone in the next room is blatantly hiding out after dismembering a young girl… “I’ll never be able to sleep”, I said to Tim as we drove into the car park. 30 minutes later, I had swept the crumbs out of the bed and I was snuggled down in between the crisp white sheets, fluffy pillows, and was away with the fairies. Best nights sleep in AGES! I have a new love for Motor Inns. More Motor Inns for the Wilson’s. Waking up a newly refreshed, calm, happy, super mother, I unpacked the croissants and made a mini breakfast for the children. Croissants + Children + motel room = a typhoon of crumbs and “Get in the bloody car, we’re going” . Luckily we wanted to get up and out early to make the most of the short amount of time we had before hitting the road to Lennox Head. It was 8:20 and we were driving through the morning traffic to see some sights. 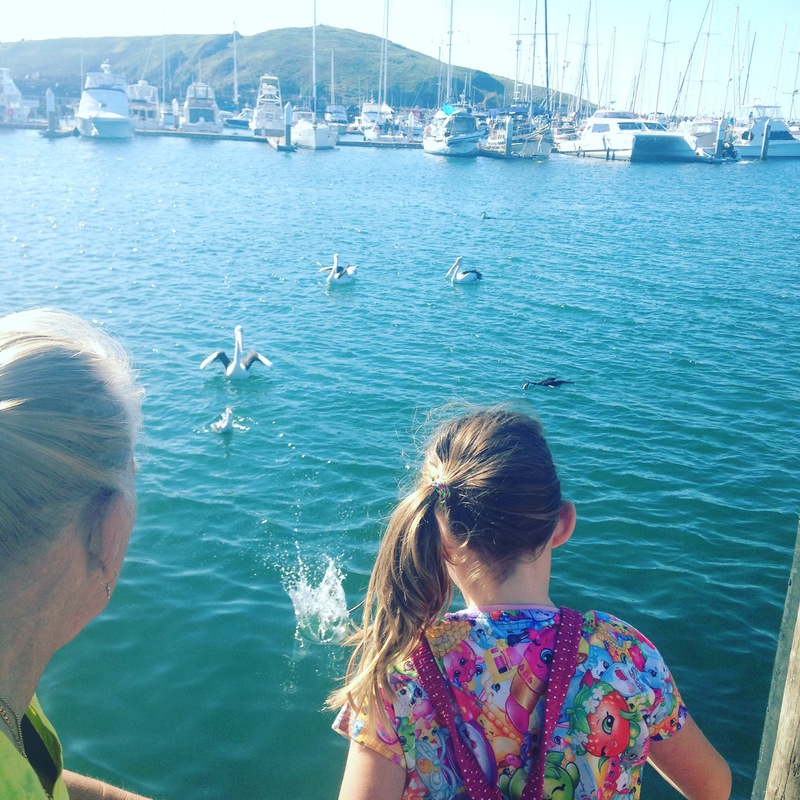 Now, you can’t go to Coffs Harbour without visiting the harbour. 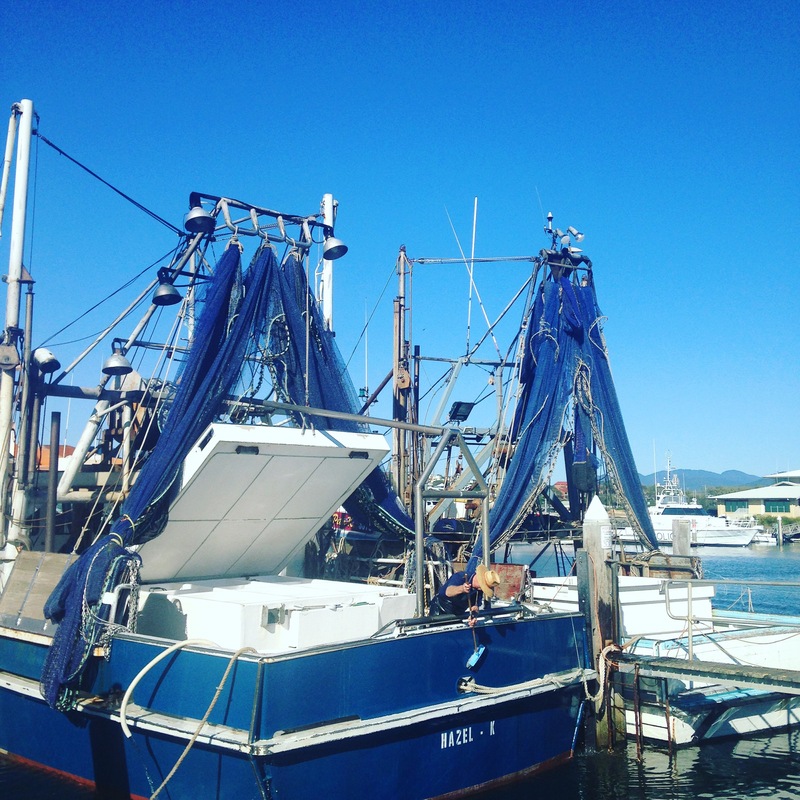 The weather beaten fishing boats were just in from a night on the seas, surrounded by Pelicans waiting for a morsel. The fishermen showed us what they had caught and handed us freshly caught and cooked prawns to try, which were just magnificent. They showed us the squid, the balmain bugs, the octopus and the whiting, it was spectacular. The children we given umpteen fish to feed the pelicans. Such special moments on our first day of the holiday. Monty spent most of the time wiping squid ink all over his hands and shouting abuse at “Mr Fat Pelican” which was nice. Once we had managed to get rid of the squid ink that was all over Monty, we headed for The Big Banana. Oh yes. The Big Banana. Mainly because Tim wanted to ride the toboggans they have there, but also because we needed to tick off another Aussie Big Thing. You can’t go to Coffs Harbour and not see the Big Banana! The toboggan ride was going well, lots of young families, all sticking to the rules. That was until Tim and Monty got on. They ended up getting berated by a terrified mother for driving too fast up behind her and her daughter. The boys were “Go Pro”ing themselves, not using the brake, and the poor lady had the fright of her life when two pommy nutters almost careered into the back of her. She was not a happy bunny. We finished up our visit in the gift shop, trying to gently persuade Monty that he choose a magnet rather than the 10ft inflatable banana, or the $60 Banana/monkey monstrosity he “needed” for his bedroom. This felt like a midnight phone call in the Oval Office, and I was Obama, desperately trying to stop some world atrocity from happening. Monty could have blown at any moment, and I was trying my best to secure peace in the parent trap that is “The gift shop”….. Why will we never learn? We walked out with a magnet, a 10ft inflatable banana, a $60 banana monstrosity for Monty’s room and yet another bloody pencil case full of MORE BLOODY PENCILS for Poppy!